...celebrated my birthday!! On Saturday my parents drove into the city for brunch at Gather, which was freaking amazing. I ordered the skillet which was full of eggs and black beans and tons of shredded pork - so good! Plus a bellini, because, birthday ;) I definitely want to go back because everything on the menu looked delish. ...had a bunch of my friends come out to dinner at Caro Mio for all of the Italian - yum! It's BYOB which I always love, and you had better believe we YOBed some Bs!!! Afterward we headed to Lincoln Karaoke, which is one of my all time favorite activities. Instead of regular karaoke where you have to embarrass yourself on stage in front of strangers, you rent a private room and everyone sings together. We rented the room for three hours but ended up staying for five because everyone was having so much fun! ...mailed off our passports to get a visa for Vietnam, which I'm totally freaked out about. You need a visa to enter the country, but since we don't live near an embassy we had to drop them in the mail. I'm going to be so nervous until they get shipped home! I'm really excited about the trip though, I ordered a bunch of stuff I think we'll need including these hiking pants that don't look too ugly haha ;) We'll be hiking in 90+ degree weather around temples so I need my knees covered, and leggings sound way too hot. ...ordered a bunch of dresses to try on for some upcoming weddings - this one, this one, and this one are currently heading my way! 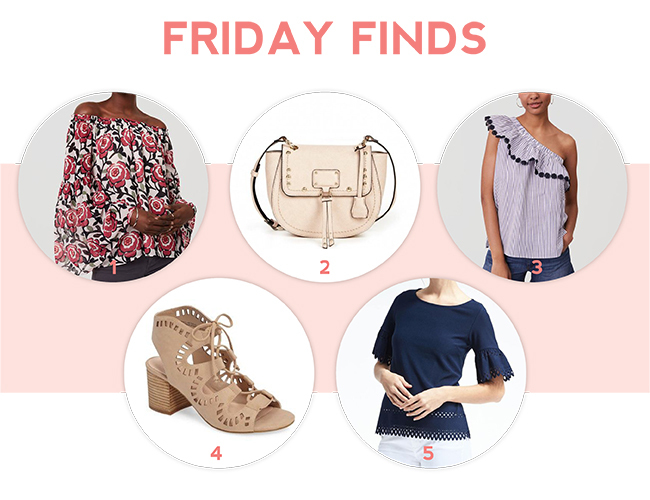 I couldn't decide which I wanted, and then I remembered that Nordstrom has free returns so I decided to just order all of them ;) I have a feeling the cold shoulder will win, but we shall see! 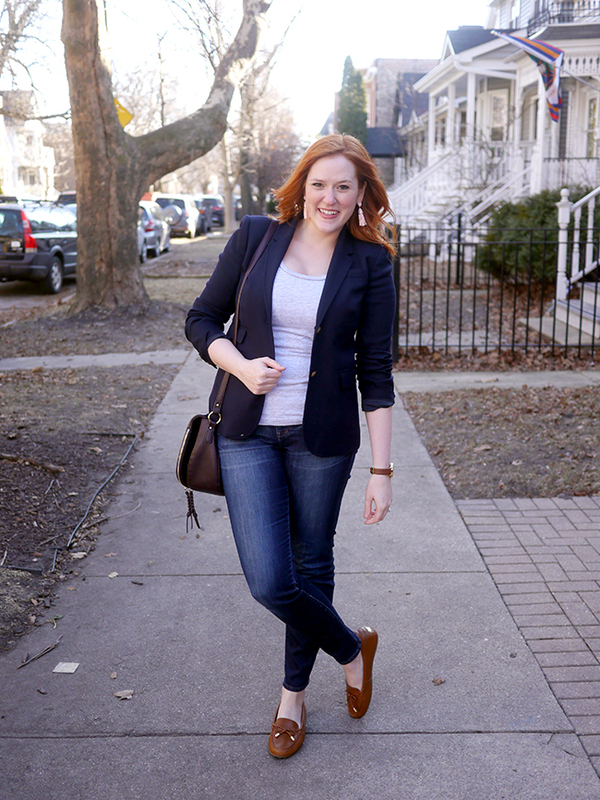 Whenever I get stuck in that rut of "not having anything to wear" (which obviously isn't true since my closet is completely full), I always fall back on an old standby - blazer + tee. 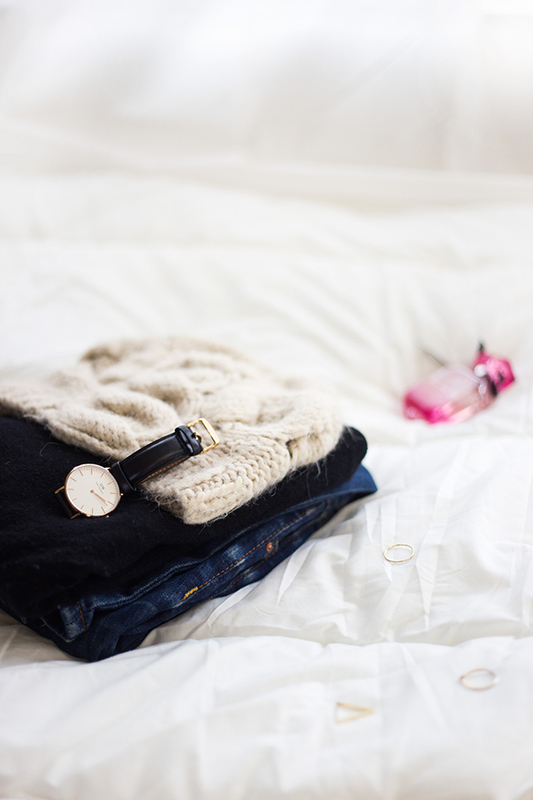 It feels casual yet polished, dressed up yet still comfortable, which really, is like living the dream. 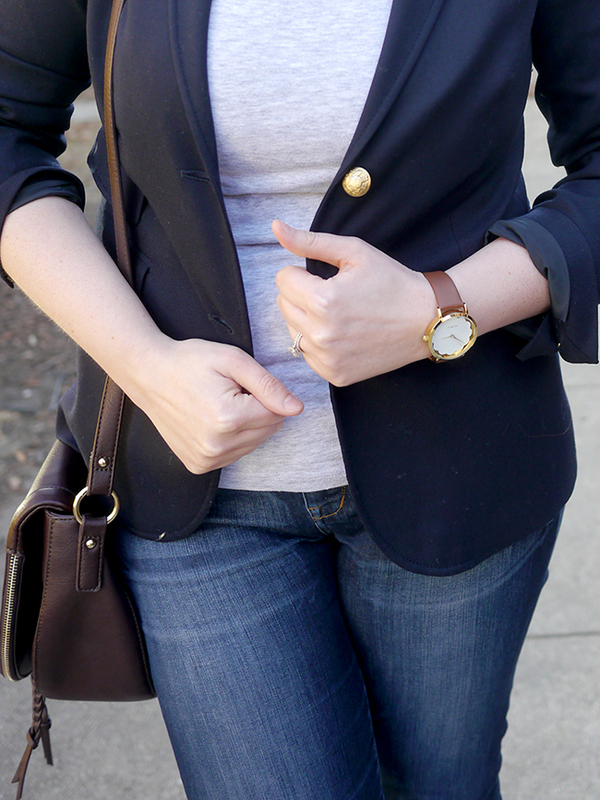 This Schoolboy blazer has been a favorite in my closet since I snagged it on clearance a couple of years ago. Unfortunately that clearance section meant that J. 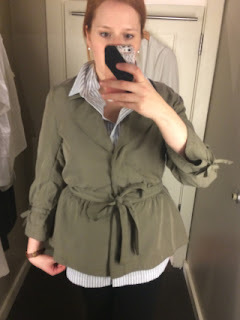 Crew was discontinuing this particular cut in favor of the Regent blazer, which I'm not in favor of because of the standing collar. No thank you! I've been looking for something similar, but hadn't had much luck. J. 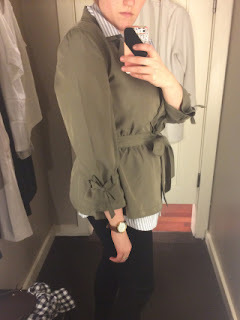 Crew Factory did release it's own Schoolboy blazer, which I tried on in stores and found to be a really similar cut and fabric as the original J.Crew version. Sadly it doesn't come in a tall though, so I'll have to keep relying on my old standby for now. Fingers crossed nothing happens to it! 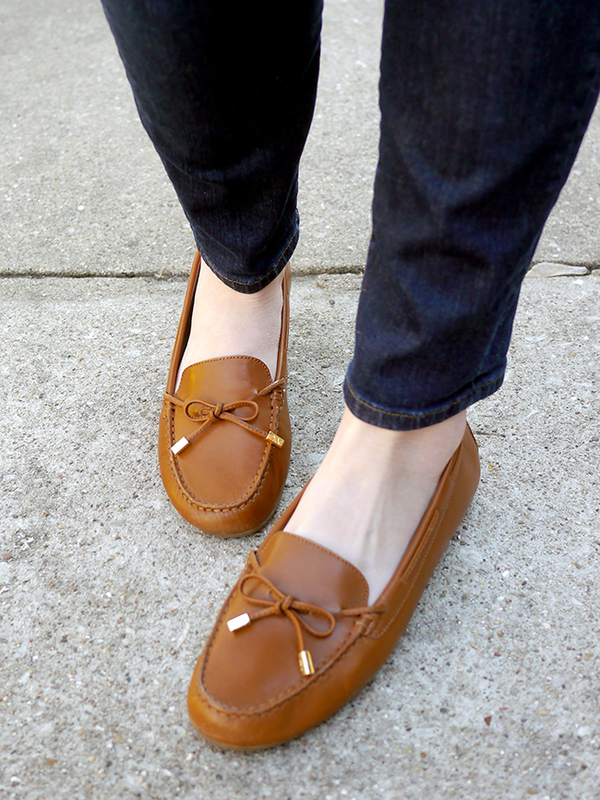 And can we talk about these flats?! My mom actually bought them for me for Christmas, which is crazy because buying shoes for someone with as picky of feet as me is tricky business. These fit like a dream though, they were so comfortable right out of the box! I haven't tested them by walking a long way in them yet (mostly because I'm scared - they do feel like they might give a blister if I do some real city walking) but for day-to-day errands and heading to work they're perfect! 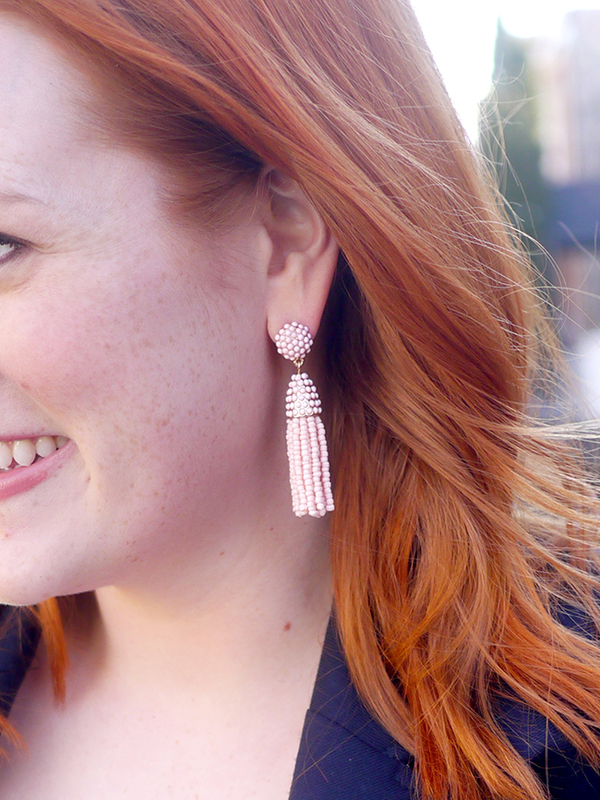 I think the style is so pretty and polished too, even though my sister said they look like something my grandma would wear. Of course, my grandma is a pretty stylish lady, so maybe it wasn't a dig! 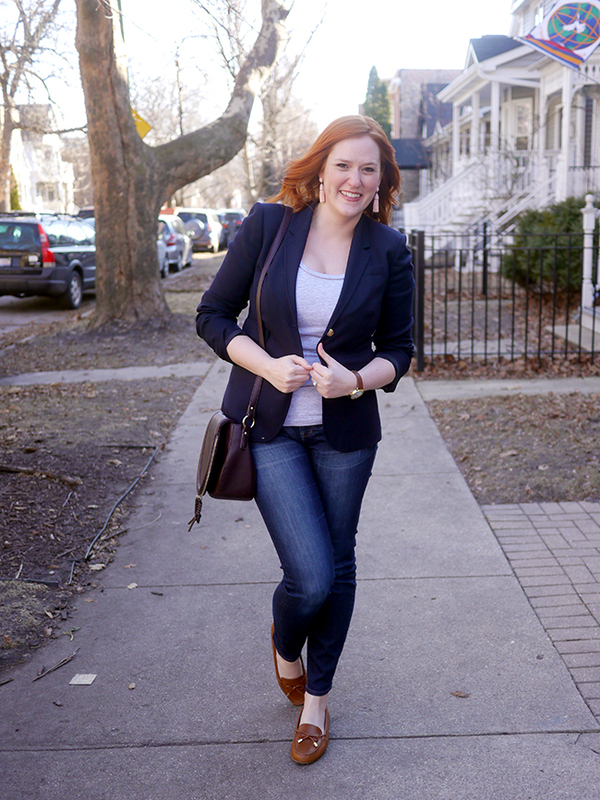 Previously on KDTI - the blazer! 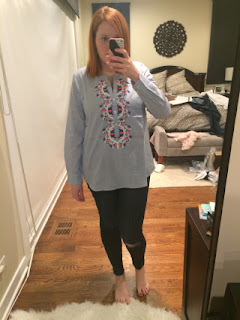 Linking up with Flashback Friday. Oh hey there, happy hump day!! 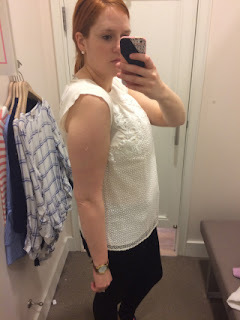 I'm coming at you today with a bunch of snaps from the fitting room (and a few from my bedroom ;). 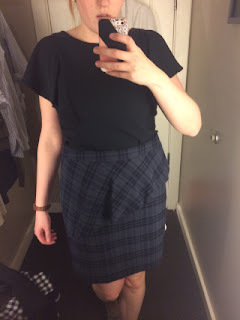 I always mean to post fitting room pictures, but then I only end up taking photos of the things I actually buy which kind of defeats the point (and makes the whole monthly budget post thing a little less interesting). 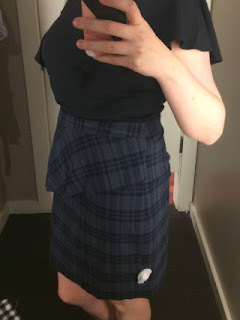 So this weekend when I was out and about I made sure to take a few more pictures so I can share a few reviews with you. 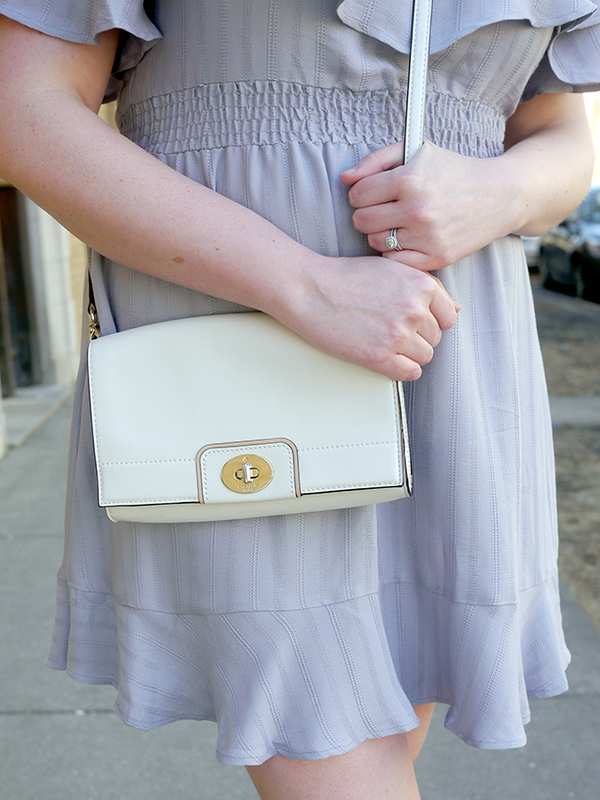 Okay, so first up is this pretty shell from LOFT. I've had this on my wishlist for a while now, but forgot to order it during my last major LOFT haul. In person, it felt a little... blah? 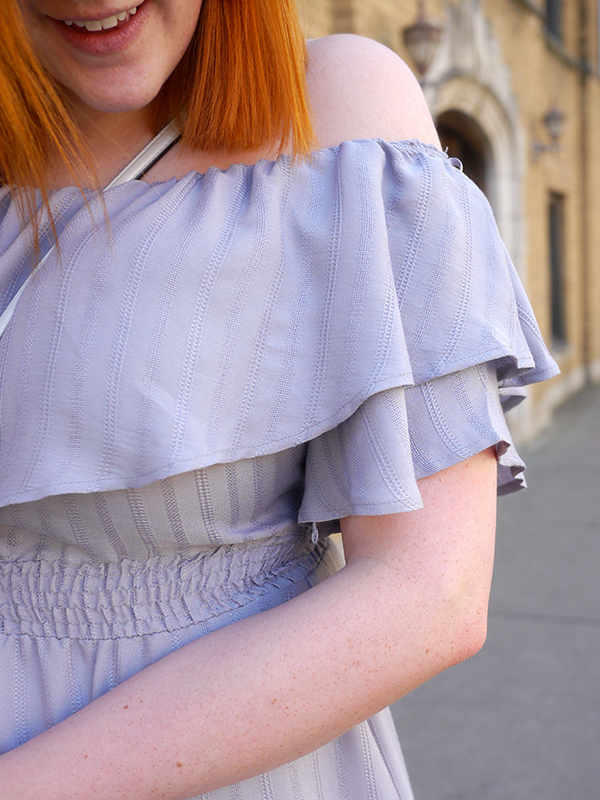 Like, it's still pretty, but between how sheer it is and the odd sleeves, it just wasn't really for me. Verdict: rejected. 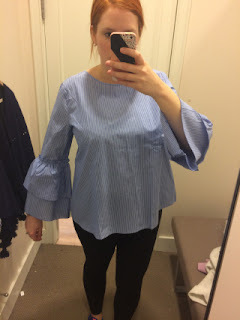 Here's another blouse I was excited about online, but just didn't quite work on my body. 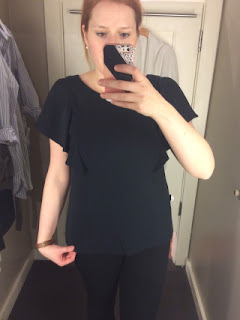 I actually like the peplum from the side, but from the front it's somehow making me too square. Plus this one was also super sheer. Verdict: rejected. Omg it's amazing how bad this is on me. I always want volume to work on me, but with curves it really doesn't work. 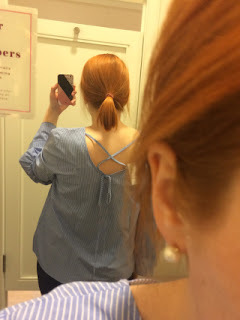 The cross back tie is super cute though, if this had worked on my body type it might have gone home with me! Verdict: rejected. 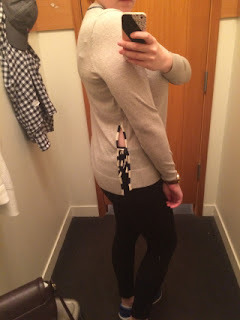 I wanted to like this sweater because the striped detail was so cute, but I can't imagine when in my life I'd like to really show off that muffin top so this one was rejected. It does come in a ton of other (non-striped) colors too. I'm wondering if in a bigger size the side ties wouldn't be an issue, but I actually really like the drape in the front. Verdict: rejected. 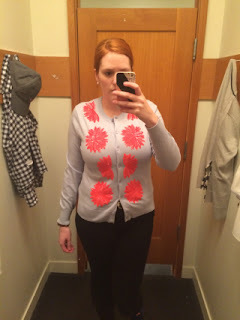 I basically had to try this sweater on after waxing poetically about it last week. My store only had this color option in stock so I decided to try it on even though I'm not crazy about this color combo. I overheard a clerk telling someone else that they sold out of the yellow version immediately, so I'm not holding my breath that I'll be able to get my hands on it. 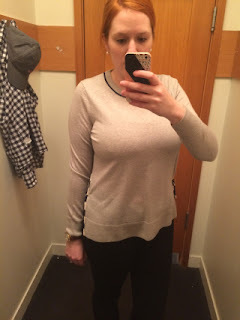 The reviews said to size up in this sweater, and man did they mean it! I initially thought the large wouldn't work at all, but twisting it around a bit made it much less gapey. I'm actually amazed that it doesn't really gape! I would want the XL though since this is a little tight. 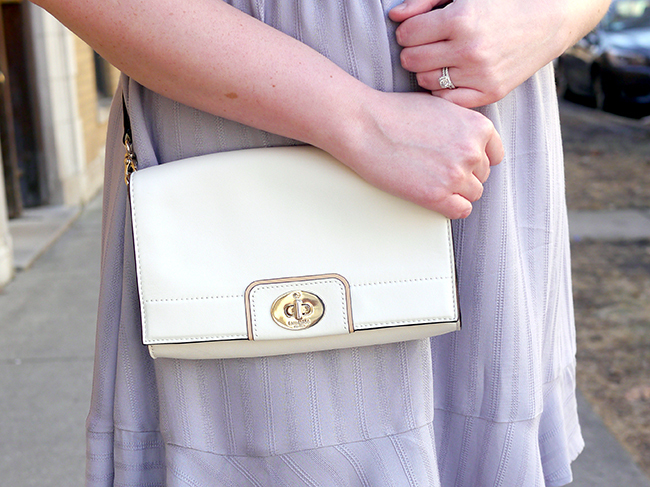 Verdict: kept on the wishlist. I thought this would be cute. It definitely is not on me - looks more like hospital scrubs! 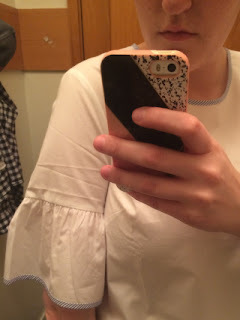 I do really like the little striped piping on the sleeves, and I'm obviously happy with this type of sleeve, but in white in this really stiff fabric just did not work. Verdict: rejected. 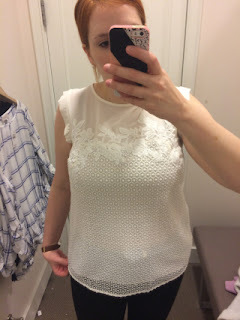 I thought this top was just beautiful - I really love the detailing and the cut. It also was nice and thick, so you wouldn't need a cami underneath. 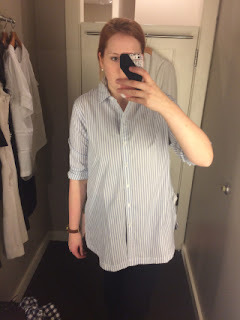 My store didn't have it in a size large though, and I think sizing down might improve the fit. 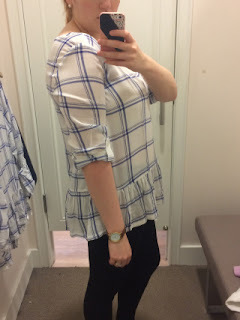 It also felt a little too similar to this blouse I just got though, so I decided to leave it behind. It's going to live on in my wishlist though ;) Verdict: added to wishlist. 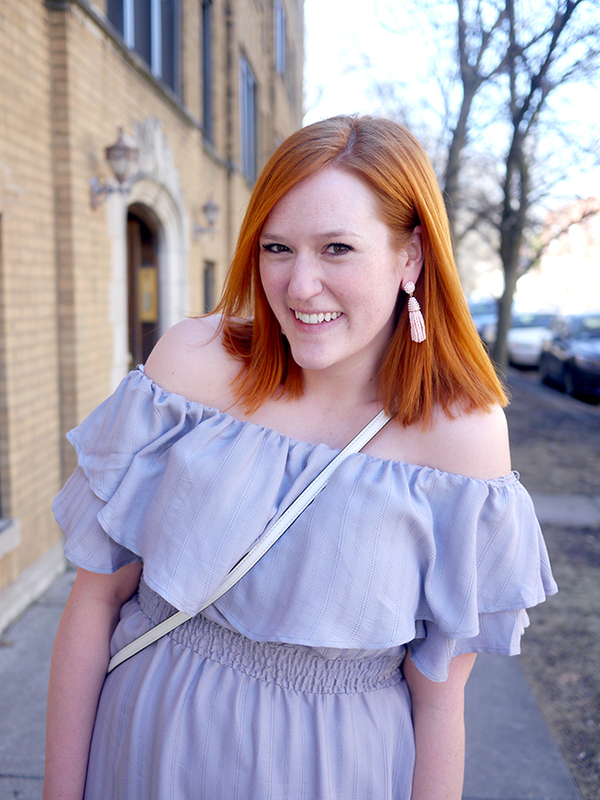 Who doesn't need another striped top, right? Unless it's huge and too long and unflattering. 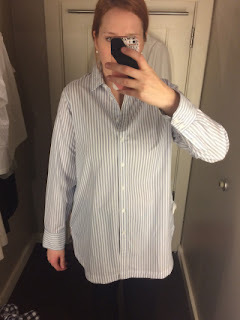 I really thought it looked like I was trying on one of Jeff's dress shirts in this. Rolling the sleeves helped, but not much. 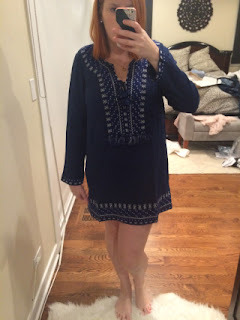 It's supposed to be a boyfriend fit and a tunic, but it's just too oversized to be flattering. Verdict: rejected. 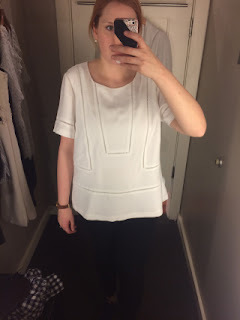 Ummm, so I thought this would be cute on me, and not crazy shaped. 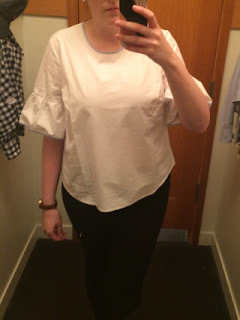 I love the bow details on the sleeves, but besides that this just was a terrible fit on me. 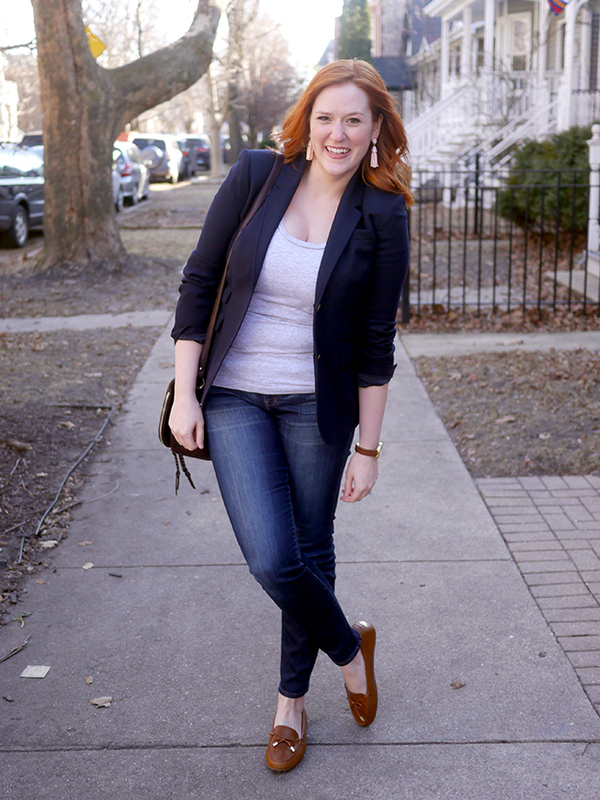 If you don't have curves or have a longer torso, it may work for you! Verdict: rejected. 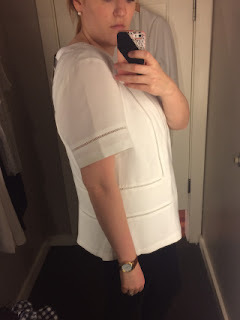 I almost didn't grab this to try on, but I'm so glad I did! The structure, the ruffles, and the back are all so pretty! 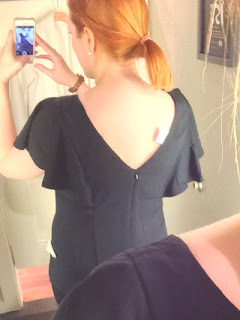 This blouse actually zips up the back, which gives it such a flattering fit. 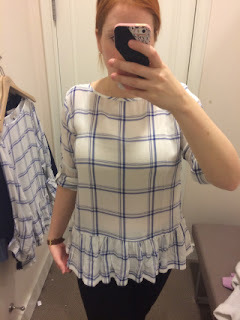 I've also tried on a lot of ruffles lately since they're everywhere, and these ones actually work on me! 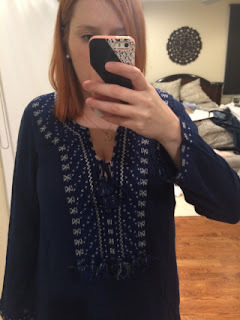 This one definitely came home with me, I can't wait to wear it with jeans or a pretty skirt. Verdict: buy! When this came in the mail, I was initially disappointed that the colors didn't quite match the website - online it looks almost gray instead of really blue. But then I tried it on, and yeah, I had to keep it. 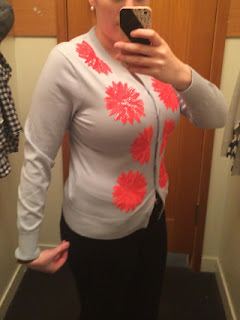 The fit is perfect, it doesn't gape, and the pink and blue design on the front is so cute. 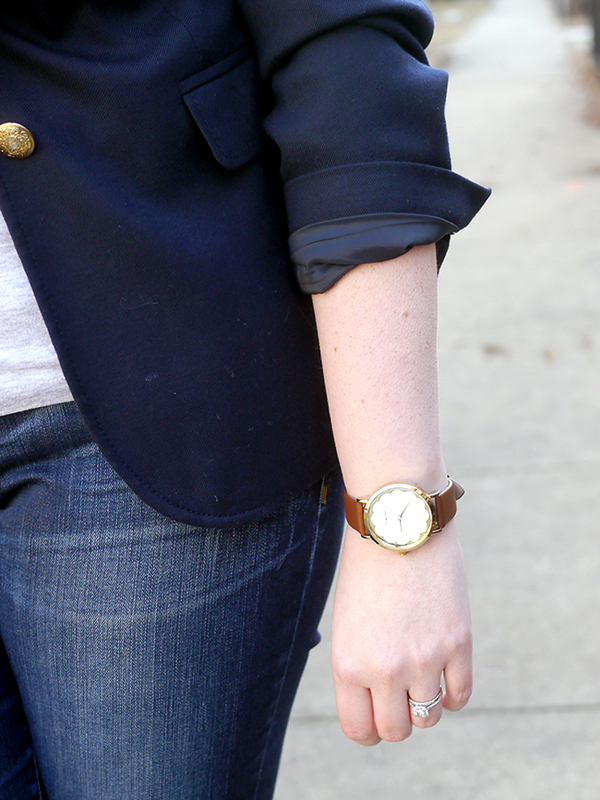 I'm definitely going to be pairing it with some white denim in the near future! Verdict: keep! I didn't want to like this. 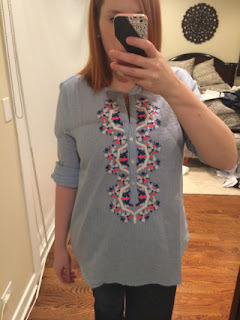 It's way more than I'd usually spend on a cover-up so I was kind of hoping I could see it, decide I didn't like it, and send it back. Nope. I love the detailing - the little tassel ties and the pom poms on the placard are so cute! And the detail stitching isn't actually white like I thought, it's a metallic silver which is so freaking adorable! I also love that this covers more than a lot of my cover-ups, but will still fold down really small in my suitcase. Verdict: keep! So, I found a lot more rejects than keepers, but that's probably a good thing since I'm already pushing the limits on my budget this month!